When you first encounter someone they make a decision about you in seven seconds. Beyond a first impression which is made during the first three seconds and is relatively shallow about your appearance and attractiveness, the next four seconds is where you seal your fate. 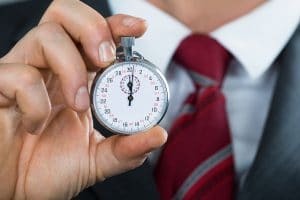 Seven seconds is all it takes to make it or break it, whether it is during a job interview, sales call, or annual performance review. A lifetime of preparation can boil down to a seven-second encounter. All of us, admittedly or not, form an opinion about a person or business within seven seconds of coming in contact with them. Those hasty judgements we make have their roots in evolution. In other words, our primitive origins drive our modern day social interactions. In fact, evolutionary psychologists go so far to suggest that we make quick decisions now because we had to act fast in early times to not end up as dinner! Our psychological make-ups have not changed while our environment and challenges have. In prehistoric times, you would have had to make a quick judgment about an encounter with an unknown animal to avoid being a snack. Today, you make a hasty decision about a new business partner, service provider, or even romantic interest to avoid being taken advantage of, or worse, physically hurt. According to Mark Schaller, a leading social psychologist at the University of British Columbia, during that critical first seven seconds of contact, we subconsciously decide whether a threat might be present and if we want to engage with someone. In seven seconds we sum up a new person well enough to try to figure out if we are interacting with a criminal or a sociopath that might steal from us or do us harm, or a nice person we want to do business with, buy a product from, or even date. Your life is a series of seven-second encounters where the world is judging you. All day everyday people decide if they want to do business with you, hire you, date you, or even be your friend. So, how do you best prepare for those fateful seven seconds? How do you connect with someone in seven seconds? Jog, bike, or walk on a regular basis. It is widely accepted that rhythmic exercise like running builds confidence, grooms effective leaders, and is associated with greater income. But, how? Exercise like walking and stair climbing are primitive. They are a central pattern generator (CPG) that once it starts it keeps going like a wheel and activates your primitive brain. While the body moves, the brain can do something else, such as listen to music or watch a television monitor. Think of a CPG as a liberator. It allows your brain to think, reflect and plan while your body does its thing. Any simple, easy rhythmic exercise calms your mind and decreases your anxiety. In the long run, it puts you in touch with your primitive, natural, and relaxed self that people will like and trust. Mimic the other person’s body language. This communicates empathy. If the person you encounter is standing, then stand. If their arms are open and at their side, yours should be too. When we convey empathy we establish a connection and within seven seconds can begin to build a lasting relationship. As we saw above, regular exercise like jogging can help over time, but not always in the moment. The problem with anxiety is that nervousness conveys uneasy excitement to others. It is unnerving and will immediately turn people off to you. When you are anxious, forget seven seconds; you are done in less than three! The reason is that primitive man would have experienced anxiety to signal danger — a lurking predator for example. So when you are anxious you are signaling a nearby threat and people will associate you with danger. To appear less anxious, remember that anxiety is your brain playing tricks on you by overvaluing social encounters. To reduce anxiety, breathe deeply and maintain open-arms and tall postures to signal to your brain that there is no threat. Next, shift your focus from you to the other person. Be empathetic. Ask yourself, what is (s)he saying? Determine how (s)he feels. By focusing on the other person, you establish rapport and are now using anxiety to your advantage during each seven-second encounter. Seven Seconds goes by in a hurry. But it is all the time we have based on how evolution wired our brains. Prepare for your seven seconds with rhythmic exercise to put your best foot forward and then use the easy how-to tips to make every seven seconds a success!